The Bribri are an indigenous tribe living in the southern mountains of Costa Rica. Our spring semester students and professors had the opportunity to visit and learn about this fascinating people. Fortunately for us, UGACR’s Spanish instructor, Ana Ligia Lopez, has given us this account of their trip! Many thanks to her and Professor Irwin Bernstein for the wonderful photos! 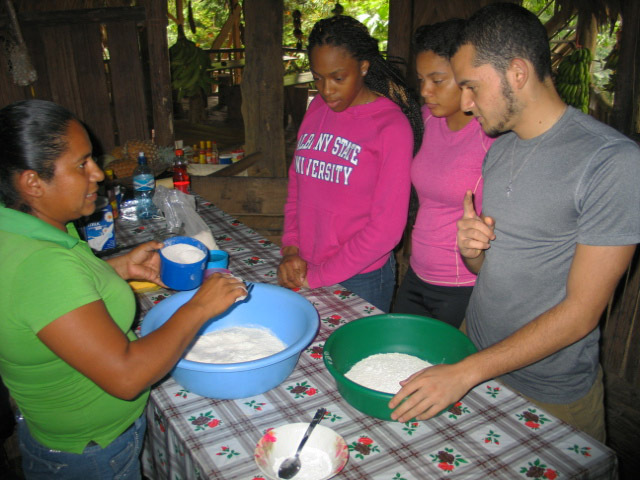 Students learn how to make fried arepas. “I must be honest. A seven to eight hour bus ride did not sound appealing to me. Especially when car sickness becomes more familiar to you that you ever thought possible. Nonetheless, being in an indigenous community in Costa Rica for a weekend did sound interesting. We left campus before 8 a.m. and arrived before dinner time after crossing the country — from the Pacific slope to the Caribbean coast. The weather wasn’t as hot as expected, but the rain came to stay on our second day. But that was a minor issue. 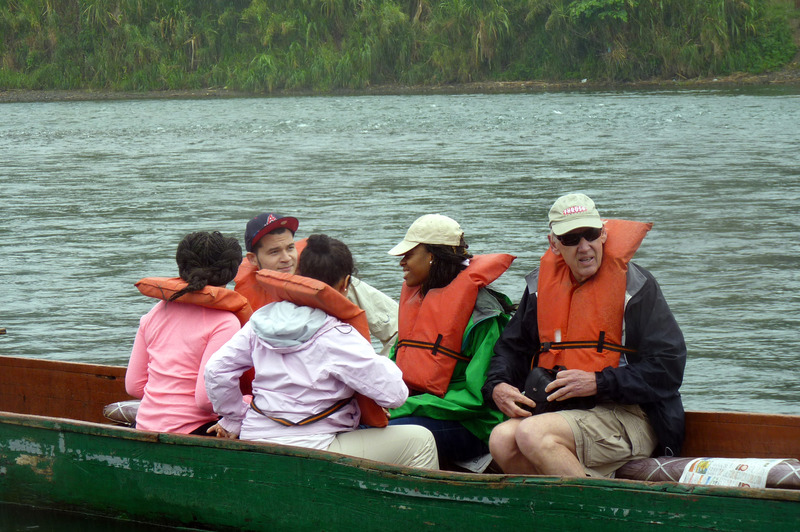 Rafael Cabraca Selles, our guide, met us downtown and we continued with him alongside the river Sixaola—the same river that makes the division between Costa Rica and Panama. Then, in a community named Bambú we found what would become home for us for the next three nights. It is called Ditsowo, or the Corn House. In that three-story house, we all slept, ate, and had discussions about different topics regarding Bribri’s worldview, culture, challenges, and political issues. After dinner, we all had a meeting. We checked our schedule for the next four days and had a briefing on Bribri culture. We learned how the universe was created and the animals that helped Sibu (the main god) build the iconical house that represents the Bribri universe. We learned about the political-religious division in the Bribri’s matrilineal society. Women own the land and can pass it on to daughters as well as be part of a clan closely related to sacred and religious roles like the awa (or shaman figure). After a good night’s sleep in our lovely tents and a delightful breakfast, we headed to the Kashabri community. In order to reach it, our driver took us right to the edge of a river. After we crossed the river, another driver awaited us and some miles afterwards we were in a wooden structure with a palm leaf roof. There, two awa and the Bribri to Spanish interpreter welcomed us. After that, we headed to the building next door, the conical house. Inside, we were taught more about Bribri’s culture and worldview. It was extremely informative and every single question was kindly answered. 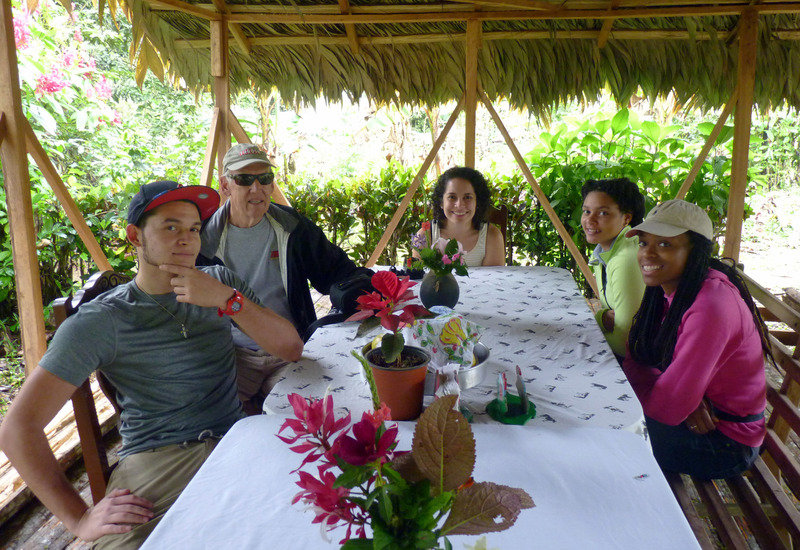 Students and professors have lunch at Katia’s farm. Then, we headed to the medicinal garden and some of the plants’ uses were explained. The respect that Bribri have for the land and every living thing is something you perceive in everything from a walk in the garden to a folk tale explaining the Earth is a female child that must be taken care of by us. Then, we were shown a replica of a sacred place that is located high in the mountains. Here the pebble wall is not more than 20 centimeters high, but in the sacred place it rises to one and a half meters. There, Sibu gave to the Bribris all the information they needed: language, all their traditions, and the sacred stones that are used by the awa in order to communicate with him. 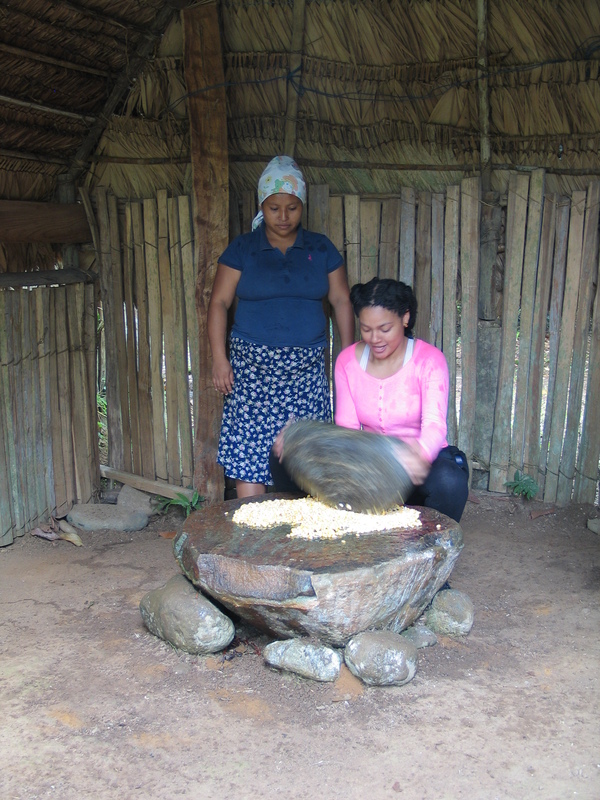 A student learns to grind corn into flour with a large stone. Right after that, we sat down around a bonfire and the awas used a specific type of leaf that, after being exposed to the fire, he passed the around our heads, arms, and legs to ask Sibu for protection and a safe trip back home. Before leaving the bonfire, we bowed twice to the fire. Then, grinding corn. By using a big piece of flat stone and another oval-shaped one, you can transform corn kernels into flour. The students were encouraged to actively participate in all activities, and this one was no exception. They realized how heavy the oval stone was and that a certain technique must be achieved in order to keep it balanced and upright. By then, we had spent all our energy and needed lunch. We had one of my favorites: heart of palm, yuca, rice and chicken. I mean, real free-range chicken. The meat is darker and so much tastier! Buying local artisan crafts is also always a good idea: someone might appreciate it back home. “Full belly, happy heart,” as we say in Spanish. We participated in the Sorbón dance. First the male starts, then the women join. After that, we thanked them for sharing their knowledge, patience and time with us. Their inner wish was that all of us share that knowledge as well. 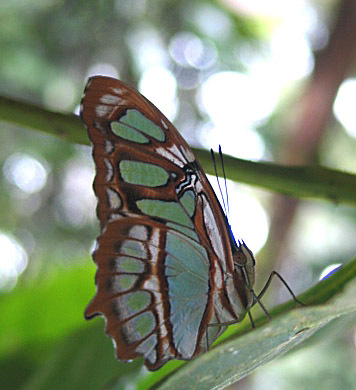 The white substance around the bitter beans from a cacao tree is sweet and acidic. 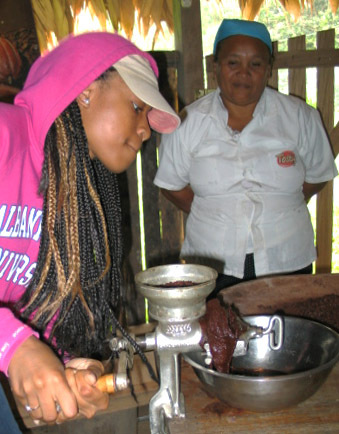 A student grinds cacao nibbs into a paste as part of the chocolate-making process. The next day, we headed to Katia’s farm. Katia is a lovely indigenous lady who is always smiling and willing to answer any questions or help you out with pretty much anything. There is a sustainable farm on her family’s property. 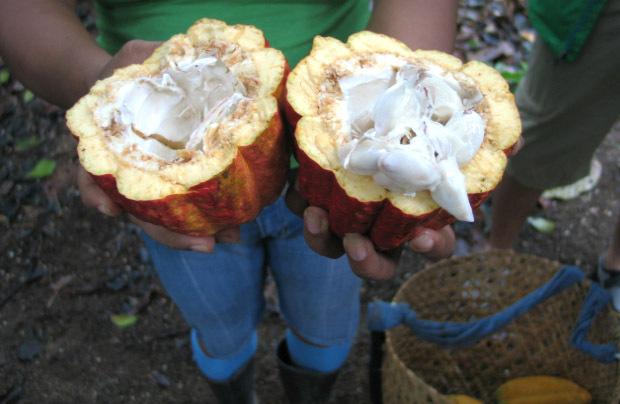 Their most important crop is cacao, that is a female plant. We walked around, fed the pigs, checked the chickens, and visited a traditional cooking place. Then, we head to ACOMUITA, a female association that all together are involved in cacao processing from the tree to your mouth. We were shown the whole process: grinding the bean, getting the pure, tasty and non-sweet chocolate paste. Lunch was held back at Katia’s place, again with tasty, tasty food. The group crosses the Telire River. Afternoon was river time! Some stayed at the shore, but one of the students decided that swimming was the way to enjoy the place. Meanwhile Rafael, Katia and myself spent some time together talking and trying to find shrimp under the river rocks. Back home, students had a cooking class! It happened that in our first breakfast we all had arepas — but a different type from the ones we usually have at UGA. These are fried, soft and brown. Since students were craving some of those, they learned how to make them. I think they had a lot of fun and hopefully they can replicate the recipe when they are back in United States. After dinner we had another talk about some threats that the Bribri people are facing: hydroelectric damps, oil exploitation and mining. This is the sloth the group saw on the way back! The next day, we had our last breakfast and it was time to go. Rafael went with us up to the Bribri downtown, and then, a long ride back home. We were lucky and the driver spotted a sloth hanging on a tree. 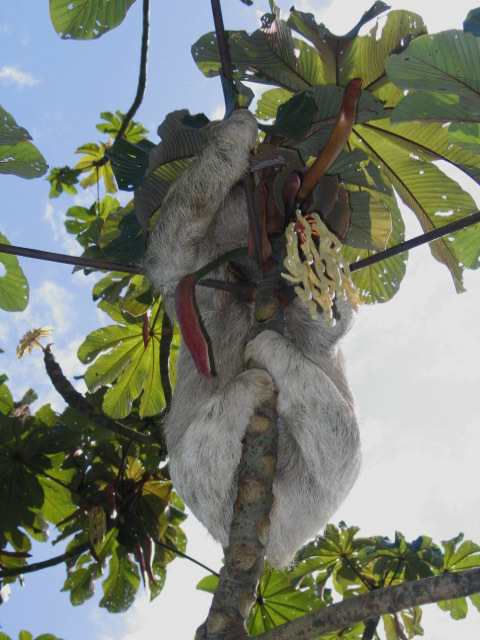 One the student’s wish was to see a sloth in Costa Rica — and her wish was granted! 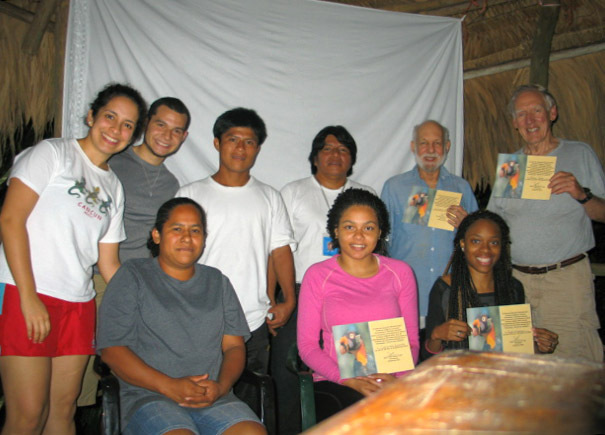 Students and professors pose with their guide and hosts after receiving certificates of participation in the program.